My son recently reminded me about a little game we used to play when he was just starting to recognise words, I never thought that much of it as it developed by accident but the fact that he still talks about it made me think I should mention it. I had printed out some High Frequency Word Bookmarks for his sister (they are from Activity Village) and they were just lying on the bookshelf (she already knew the words) so one day when I was reading to him he asked if we could use the bookmarks for his book. So we did. 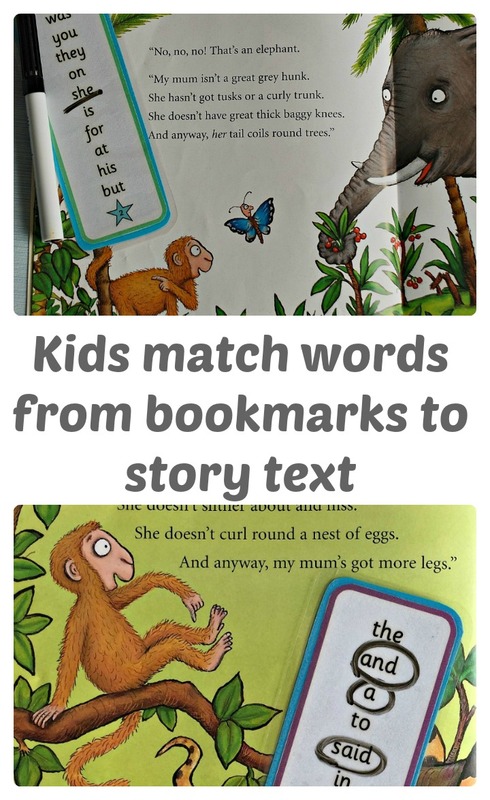 And while I was reading the story I noticed he was looking at the bookmark and then back at the text in the story and then he commented – “look mom those two words are the same” – he pointed to a word on the bookmark and a word in the text of the book I was reading to him. And he was correct. So I asked if there were any other words he could spot. He slowly worked through the text and bit by bit he started matching the words back to the bookmark. After he had finished he asked for another story and as I read it to him he started looking for the words. The bookmarks were laminated so I suggested we take it a step further and as soon as he spots the word he could circle or underline the word on his bookmark. He loved this. Our little bookmark activity continued for months. He loved hunting for the words in the text of the stories and I do think it helped with his sight words and his reading confidence. Extra comment – for those of you wondering we have followed a combined phonics and sight word approach with both kids. I do think knowing the sounds helps with reading and spelling but I also think practicing basic sight words builds reading confidence. This entry was posted in Homeschooling and tagged activity village, home education, homeschooling, Learning to read, Monkey Puzzle, sight words, word games. Bookmark the permalink.